Microsoft dropped a bombshell at CES today, announcing that the next version of the Windows OS will run on ARM processors. 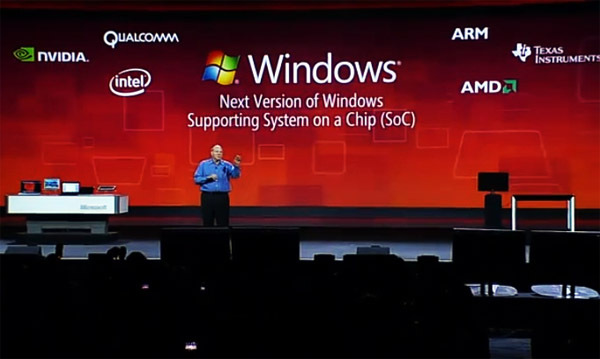 The company stated that Windows for ARM will run on SoC (System on a Chip) architectures and will support hardware accelerated web browsing, media playback, and peripheral support on par with standard x86 Windows. The move is aimed at extending the Windows experience to new devices. “Windows PCs will continue to adapt and evolve,” CEO Steve Ballmer said in his keynote. 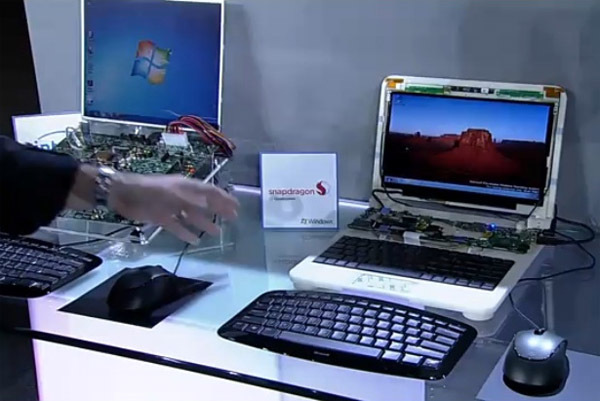 “It means Windows will be everywhere on every kind of device without compromise.” The company showed off demo units running a future version of Windows (but with the user interface from Windows 7) on ARM chips from Qualcomm, Nvidia, and Texas Instruments. The ARM-powered machines were running just Internet Explorer 9, Office for ARM, and an Epson printer driver. The Nvidia Tegra 2 demo box, however, was nonetheless impressive, smoothly playing the Iron Man 2 trailer in 1080p and running the IE9 HTML5 demos without any hiccups. Read on for more details about Microsoft’s ARM announcement, and see our Smartphone Processor Guide for more information about ARM’s SoC processor architectures. Currently, Microsoft has two different lines of Windows- “full” Windows for laptops, desktops, and such running on Intel and AMD’s x86 CPUs and Windows CE for devices that run on ARM chips, like GPS navigation units and smartphones (via Windows Phone 7, which runs on top of the WinCE core). Portable devices like smartphones and, more recently, tablets, use ARM processors due to their lower power consumption, but in recent years, ARM chips have also dramatically improved in performance and are almost competitive with Intel’s low-power Atom line, at a fraction of the power usage and heat output. Windows on ARM should help Microsoft gain some ground in the tablet market, which it has thus far pretty much left alone for Apple, Google, and others to compete in. One key issue is that while the basic experience of Windows on ARM should be similar to that of Windows on x86, the two OSes cannot run the same native applications. .NET / Silverlight apps, which Microsoft is pushing in any case, should be fine, but most large commercial software packages will require separate versions. Timing is also in question- the tablet market is exploding today, yet Windows 8 likely won’t hit the market until late 2012. Can Microsoft avoid missing the boat and having to invest massively to try to catch up (as it had to in the smartphone arena)?